The Boy Scouts of America places the greatest importance on creating the most secure environment possible for our youth members. All adult volunteers must be familiar with the principles of Youth Protection. A wide array of training opportunities for Youth Protection are available. Learn more about Youth Protection Training. 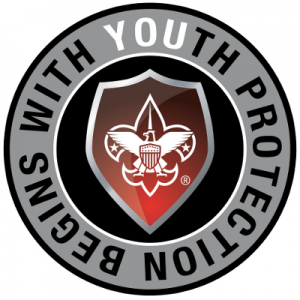 Click here for the March 8, 2018 BSA Announcement on the New Youth Protection Training. Council Scout Executive Charles Flowers. or via e-mail at charles.flowers@scouting.org. True youth protection can only be achieved through the focused commitment of EVERYONE in Scouting. It is the mission of Youth Protection volunteers and professionals to work within the Boy Scouts of America to maintain a culture of youthy protection awareness and safety at all levels in our organization, including the unit, district, council, area, region, and national levels. Connecticut Yankee Council has created the position of Youth Protection Champion, or Advocate. Individuals serving in this position will provide support for each unit (Pack, Troop, Team, Crew, and Ship), each district, as well as for the Council.